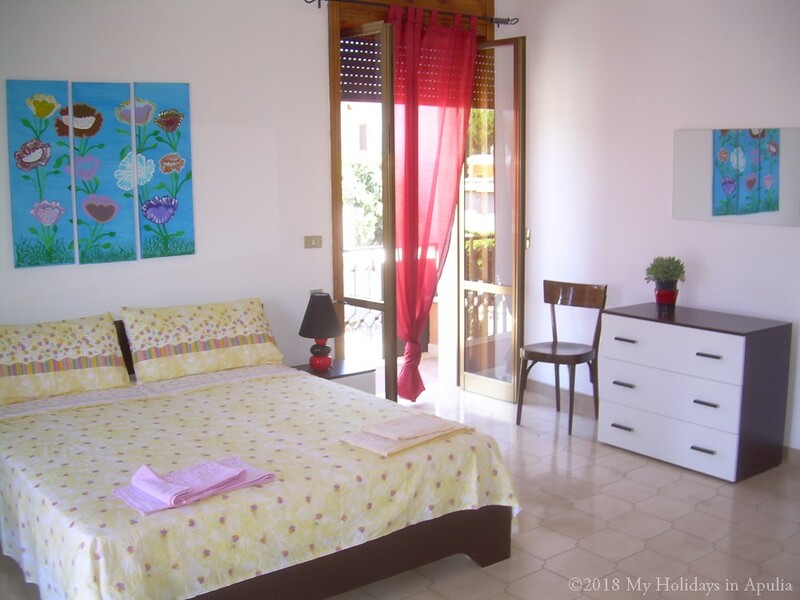 The 4 bedrooms Amandine holiday apartment is situated in Aradeo, a friendly small town between the rocky Adriatic and the sandy Ionian Sea. This 1st floored apartment boasts four wide bedrooms comfortably giving lodging up to eight guests. Two bedrooms have balconies on the front of the property, while the other two bedrooms look into a bright cloister, a game room for children. The family colorful living room has two big sofas, ideal for taking a nap. Two bathrooms: the biggest one has a bathtub, while the smaller one has a shower. A lovely kitchen, with dining area for eight guests, is equipped for self catering. From the kitchen, stairs lead to a private, huge roof-garden, a perfect setting for relaxing moments, for toasting Italian holiday in a good local rosé wine and mouthwatering, Mediterranean flavoured appetizers. Aradeo, a friendly town (twinned with Pasvalys, Latvia and Bystrzyca Klodzka, Poland) is only few minutes of driving or biking from a natural park and open sky fossil museum in the countryside area (once, in the past, it was an old mine for the typical leccese stone and clay exploitation). A small train station is just 1,5 km outside the town and it is well connected with bigger art centers and sea spots. It is possible to organize several cultural excursions like a full immersion trip to learn the precious Baroque Art Style in Lecce (only twenty-seven km from Aradeo). There are great opportunities for sightseeing in Salento, astonishing sceneries and romantic places for painting or shooting holiday memories films. From the geographically privileged position of Aradeo, in Salento, it takes only fifteen or twenty minutes for reaching the white sandy Ionian or the rocky Adriatic coasts. Gallipoli, Otranto, Santa Maria di Leuca are perfect places for amazing swimming, diving, sailing into Caribbean seas.